The correct use of thermocouples can not only accurately obtain the temperature value, but also ensure the product is qualified, and also save the material consumption of the thermocouple, saving money and ensuring product quality. Improper installation, thermal conductivity and time lag are the main errors in the use of thermocouples. If the position and insertion depth of the thermocouple installation do not reflect the true temperature of the furnace, etc., in other words, the thermocouple should not be placed too close to the door and the place of heating, the depth of insertion should be at least 8 to 10 times the diameter of the protection tube; The gap between the protective sleeve and the wall of the thermocouple is not filled with thermal substances, so that the heat in the furnace overflows or the cold air invades. Therefore, the gap between the thermocouple protection tube and the hole of the furnace wall is blocked by heat insulating materials such as refractory mud or asbestos rope to avoid hot and cold. Air convection affects the accuracy of temperature measurement; the cold junction of the thermocouple is too close to the furnace body to make the temperature exceed 100 °C; the thermocouple should be installed as far as possible to avoid strong magnetic field and strong electric field, so the thermocouple and power cable should not be installed in In the same duct, the error may be caused by introducing interference; the thermocouple cannot be installed in the area where the measured medium rarely flows. When the temperature of the gas in the tube is measured by the thermocouple, the thermocouple must be installed against the flow direction and fully in contact with the gas. . If the thermocouple is insulated, the dirt or salt slag of the protection tube and the pull-wire board may cause poor insulation between the thermocouple and the furnace wall, and it is more serious at high temperature, which not only causes the loss of the thermoelectric potential but also introduces interference. The resulting error can sometimes reach up to Baidu. Since the thermal inertia of the thermocouple causes the meter's indicated value to lag behind the measured temperature, this effect is particularly pronounced when making rapid measurements. Therefore, thermocouples with thinner hot electrodes and smaller diameters of protective tubes should be used as much as possible. When the temperature measurement environment permits, the protection tube can even be removed. Due to the measurement lag, the amplitude of the temperature fluctuation detected by the thermocouple is smaller than the amplitude of the furnace temperature fluctuation. The larger the measurement lag, the smaller the amplitude of the thermocouple fluctuation and the greater the difference from the actual furnace temperature. When the temperature is measured or controlled by a thermocouple with a large time constant, although the temperature displayed by the meter fluctuates little, the fluctuation of the actual furnace temperature may be large. In order to accurately measure the temperature, a thermocouple with a small time constant should be selected. The time constant is inversely proportional to the heat transfer coefficient, and is proportional to the diameter of the hot end of the thermocouple, the density of the material, and the specific heat. To reduce the time constant, in addition to increasing the heat transfer coefficient, the most effective way is to minimize the size of the hot end. . In use, a material with good thermal conductivity is generally used, and a protective sleeve having a thin wall and a small inner diameter is used. 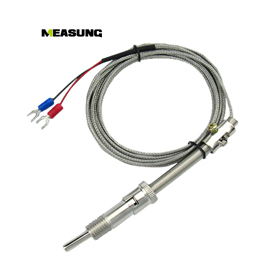 In the more precise temperature measurement, the bare wire thermocouple without protective sleeve is used, but the thermocouple is easily damaged and should be corrected and replaced in time. At high temperatures, if there is a layer of coal ash on the protective tube, dust is attached to it, the thermal resistance increases, hindering the conduction of heat, and the temperature indication is lower than the true value of the measured temperature. Therefore, the outside of the thermocouple protection tube should be kept clean to reduce the error.